For a lot of people, finding the right appliances is one of the most exciting parts of a kitchen remodel. If you want to ensure you’re happy with your choices, there are some things you should consider long before you approve your kitchen design. A new refrigerator, stove top, range, dishwasher, and other major appliances are not only a joy to work with, they’re also one of the biggest line items in your budget. Choosing the right appliances for your kitchen remodel is something that can, and should, be done throughout the planning and designing stages. Here’s why. The appliance package you want has a cascading effect on the kitchen’s design. Just one example: if you plan on installing a 6-burner gas cooktop, your designer needs to know that before creating your counter and cabinet layouts. A well-thought out plan before you start shopping guarantees you’ll be happy with the looks and function of your appliances. Think about the style kitchen you want and then start picking out what goes in it. Appliances that seamlessly blend in with their surroundings (think panel-ready or built-in) work with both traditional and contemporary styles. Flush installation, where appliances are the same depth as your cabinetry, give a nice clean look. Some people even opt for custom panels that match their cabinets. Naturally, a spacious kitchen allows you to choose larger appliances. But even if space is limited, today’s more compact versions work harder than ever without sacrificing good looks and high-tech features. While most other appliances come in relatively standard sizes, refrigerators can range in size a lot. These days freestanding refrigerators are getting deeper and deeper, which means they stick out pretty far but give you more storage capacity. More storage is great but these behemoths can really take up a lot of space in the kitchen. If you don’t want the fridge to stick out as much, consider a counter depth refrigerator that only sticks out a few inches. Or, consider a built-in refrigerator which will be flush with you cabients and can be panelled to blend right in with the rest of the cabinets. Top or Bottom Freezer and other choices? Next to size, the main choices for fridges are top or bottom-mounted freezer, side by side, or french doors. A bottom freezer has a lot of benefits, especially that it puts the more frequently used fresh food compartment at eye level. 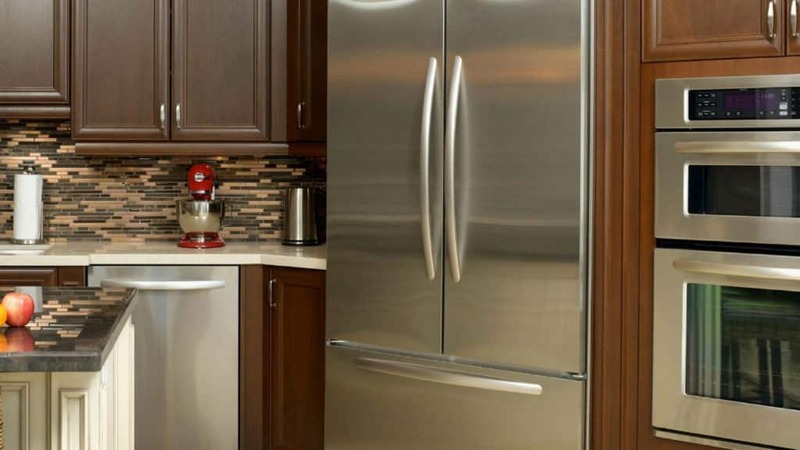 Side by side refrigerators feature a column freezer that makes it easier to find frozen items. While they offer more organization, side by side fridges do limit the types of items that can be stored. Items such as pizza boxes, platters or serving trays, tall drink pitchers, and bulk size products are difficult to find a place for in this style fridge. If you’re buying a wider fridge, make sure it doesn’t block traffic when the doors are open. Tight space in front of the refrigerator because of an island? Choose french doors that are narrower. Some people also like to include a second smaller fridge in the island or peninsula. 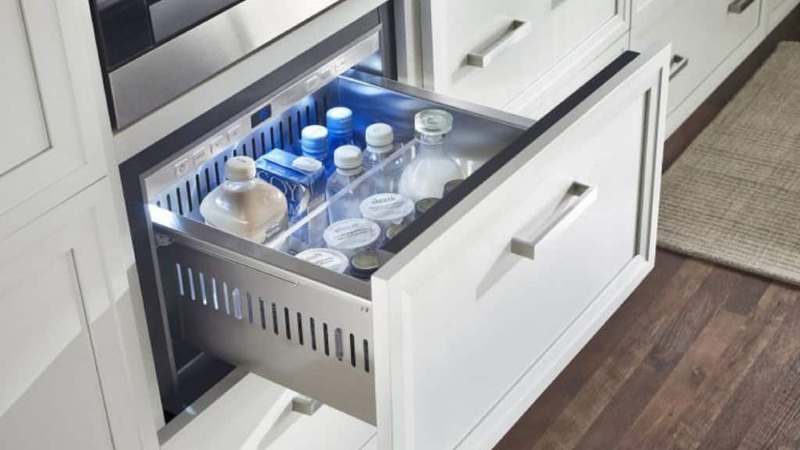 If you have children, you also might want to install one or more refrigerator drawers where they can help themselves to beverages and snacks. Are you a novice or a chef-level cook? Do you want to boost your entertaining chops? Your cooking appliances are made up of two main components: the cooktop and the oven. Your cooktop can be gas, electric, or induction. Traditional Electric stovetops are slow to heat up but come at a great pricepoint and offers a smooth surface that is easier to clean. Gas cooktops heat up faster and gives you better control over the temperature. Induction cooktops give you the benefits of each with a smooth surface that heats up fast and gives you more control over cooking temperature. Induction uses a magnetic field to heat the entire pan so you have even heating throughout the pan and don’t leave the surface hot unlike with gas and traditional electric tops that radiate heat..
Electric ovens have more even heating throughout the cavity than gas ovens. Even better than that is an electric oven with convection which have a fan to help circulate the air and ensure there are no hot spots. Have you ever seen a cookie recipe that calls for rotating pans in the middle of baking? You have to do this with a traditional oven since the oven is hotter on the bottom where the coils are causing the bottom rack to cook faster than the top rack. You don’t have to do that with convection! Another big decision to make for your cooking appliances is if you would like the cooktop separate from the oven or together. A range which has the cooktop and oven in one appliance is efficient and saves space in your kitchen. Having the cooktop and a wall oven allows you to separate your cooking zones and are great for kitchens with two cooks! Many people panel the dishwasher with something that matches their cabinet doors to give the lower cabinets a more streamlined look. If this is the look you want, make sure to get a dishwasher that is described as “panel ready”. Though they’ve seen the fewest recent tech changes, microwaves remain one of the most popular appliances in the house. Over the range, microwaves get your microwave off of the counter and keep your kitchen from looking cluttered. Microwaves can also easily be concealed in a drawer, island, pantry, or built in. Though many experts advise not mounting above the range since it’s usually too high to properly use and you run the risk of spilling or dropping hot food on yourself, it is the most efficient for small kitchens since all over the range microwaves have a vent built in! Convection microwaves still quickly cook meals but add a crisping or brown finish thanks to the flow of hot air. Serious cooktops demand a ventilation system that removes exhaust from the kitchen without sounding like a Boeing 787 while doing it. Don’t forget to choose a hood with adequate CFMs (cubic feet per minute). For best results removing steam and strong odors, choose a hood with at least 400 CFMs and one that is at least 3” larger than the cooktop it’s mounted above. 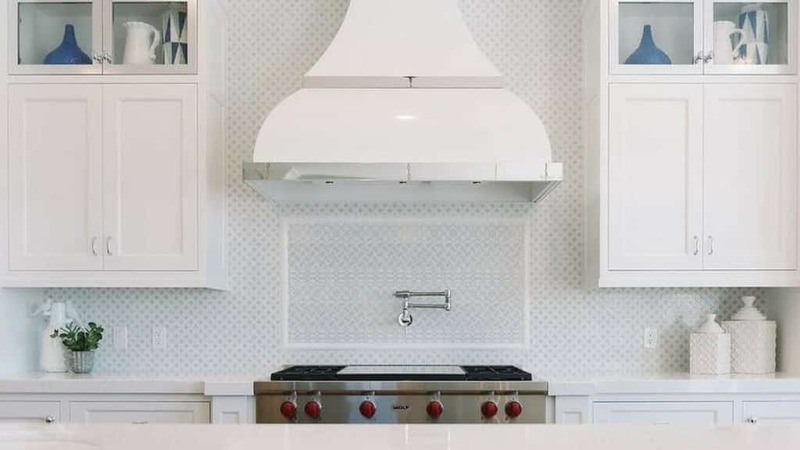 No longer designed for function alone, today’s range hoods come in a variety of different styles to complement your kitchen’s style. 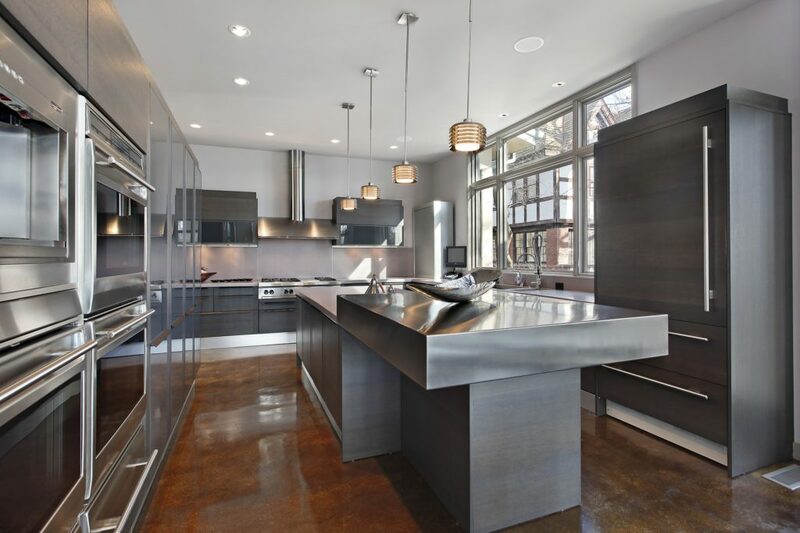 A note about CFM: Very powerful exhaust fans are becoming popular in residential kitchens. But more air flow is not always better. 400 is enough for most kitchens, any more than that can lead to issues with your home’s HVAC system since any air removed from the home thru an exhaust fan need to be brought in from somewhere else. In fact, new building codes may require make up air systems be installed for any exhaust system greater than 400 CFM. Downdraft hoods exhaust through a wall or crawlspace to the outside of the home. Depending on where your cooktop is located you may need an island hood, a wall mounted hood, an under cabinet hood, or a built-in hood. If your cooktop is on an island or peninsula then you need to look for an island hood. Hoods mounted flush to the ceiling are becoming popular in homes as well. They are sleek and low profile but the CFMs need to be much higher since they are further away from the cooking surface. Higher CFMs might mean you needs to include make up air in your design. When choosing an exhaust hood also consider picking one with a timer that allows you to run the fan for 15-20 minutes after you leave the kitchen to help get rid of any residual odors. Even though our designer, Caitlyn, sold appliances for many years prior to joining our team we still recommend you work with an appliance specialist. We really like working with Bobby Dollar Appliances (http://www.bobbydollar.com/) up in Thomasville, GA. Bobby has a very knowledgeable staff, offers great service and has the largest appliance showroom in the area. We like to joke that the name “Bobby Dollar” sounds a little like a used car dealership but you won’t find a nicer guy or better partner when shopping for new appliances than Bobby. Ready to get started on your Tallahassee kitchen remodel? Give us a call. We look forward to meeting with you!